A chapbook has traditionally been defined as literature consisting chiefly of small pamphlets of popular tales, ballads, children's stories, religious tracts, political tracts, nursery rhymes, folk tales, almanacs, and poetry. To modern writers, a chapbook is simply a booklet of creative work about 30 to 40 pages long. Many publishers host chapbook contests, awarding the winners a cash prize and a chapbook publication. Chapbooks first came about in 16th century Europe with popular fairy tales like "Jack and Giant Killer." They were cheaply constructed and not always pleasing to the eye, but during the 1500s they were purchased by people who otherwise weren't able to buy books and were often thrown out after reading or repurposed. Chapbooks were an important means for disseminating popular culture to common people, particularly those who lived in rural areas. They entertained, provided information and offered history. Chapbooks even contributed to increasing the rate of literacy. Illiteracy in England during the 1640s was around 70% for men, and the rate dropped to 40% during the mid-18th century. The number of chapbooks printed in England is mind-boggling. During the 1660s, as many as 400,000 almanacs were printed every year, enough to distribute to one of every three families in Britain. Chapbooks were priced to be affordable to workers, although their sales were not limited to the working classes. Ballads sold for a halfpenny or just a few pence. Chapbooks seemed to disappear until the 19th century, but in the last 100 years, they've resurfaced, mainly among poetry and short prose writers. Chapbooks are usually artful, well-made pamphlets bound by saddle-staples. One feature that hasn't changed over time is that they generally boast a greater aesthetic or artistic quality that traditional books because publishers are more willing to experiment given that the print run is shorter. While chapbooks don't count as a "real" book publication, they do carry a degree of prestige. For writers -- usually poets -- it's a chance to showcase part of a manuscript or to see a shorter work published. 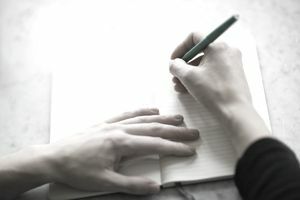 Poetry chapbooks are the most common, and while the chapbook doesn't qualify as a full-length publication, it is a beneficial opportunity for the writer to experiment and to use it as a springboard for professional development. New York's Center for Book Arts' poetry chapbook contest offers opportunities for artists and writers to work together in creating what is essentially a work of art. Only 100 copies of the book are printed, and 10 of them go to the artist. Other chapbook contests may not focus as much on the history and aesthetics of the book, but they do generally produce a more artful product than standard book publishers. The smaller size and print run allow for greater emphasis on design and aesthetics. While they may not reach a huge audience, chapbooks can be appreciated as a physical object in a way that many contemporary books cannot.